The global single-use bioprocessing market is expected to grow at a compound annual growth rate (CAGR) of 17.8% from 2016 to 2021. Single-use bioprocessing is a rapidly evolving technology that is used in the development of disposable bioprocessing equipment and accessories to manufacture biopharmaceutical products. Why is this technology gaining so much traction? Six key advantages of single-use bioprocessing are described below. The disposable equipment help in reducing the costs associated with complex steps such as sterilization, cleaning, and maintenance of steel-based bioreactor systems and accessories. The growth in this market is majorly driven by the increasing demand for biopharmaceuticals, as single-use bioprocessing systems play a significant role in reducing the initial investments and R&D costs involved in the manufacturing process of biologics. Moreover, the deployment of single-use bioprocessing systems increases the productivity of manufacturing processes as a result of reductions in cost and complexity of automation and elimination of the need for changeover cleaning/validation between consecutive operations. However, issues such as plastic waste and extractability and leachability of the materials used in bioprocessing are expected to restrict the growth of this market. Conventional bioprocessing and manufacturing of biologics and bioproducts involves the use of steel-based bioreactors and their subcomponents. 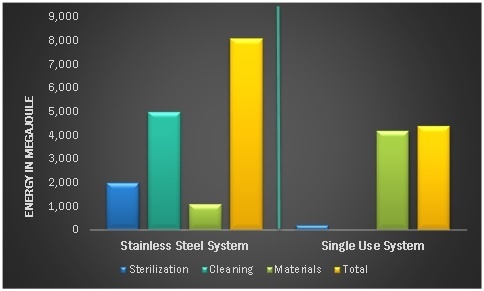 Most of these products require sterilization and associated units for manufacturing contamination-free bioproducts, which increases the overall investments for manufacturers. On the other hand, single-use bioprocessing systems eliminate the need for additional investments by removing the need for sterilization. The initial investment costs are approximately 40% lower compared to a stainless steel facility at the same scale. One of the major advantages of single-use technology in pilot and full-scale manufacturing is the direct savings in terms of low costs of labor and materials. The direct cost of labor for assembly and the cost of water and chemicals are low for single-use systems (SUS) when compared to the equivalent stainless steel hardware systems. Also, the adoption of single-use systems eliminates the clean-in-place (CIP) and sterilize-in-place (SIP) steps, which improves facility utilization time and reduces the overall operating costs and analytical quality control costs, specifically for raw materials. The major difference between single-use operations and traditional operations is in the sanitization and cleaning process. Since single-use systems are disposable, they do not require the same kind of sanitization, and the material used to manufacture these systems can be easily disposed or incinerated after use. The transition from conventional equipment to a single-use system actually results in less energy demand and water use. For instance, biopharmaceutical manufacturing plants which adopted single-use technologies experienced a 46% decline in total water consumption and total energy consumption as compared to a stainless-steel reactor set-up. Single-use plants also have a 35% more favorable CO2 balance than stainless-steel reactors. These advantages are expected to increase the uptake of single-use bioprocessing systems in the coming years. A single-use solution should be ergonomically designed to hold integrated single-use flow paths for faster set-up and reduced space requirements. This will reduce the amount of time the staff spends on preparation, set-up, validation, and documentation along with related costs. Also, with the elimination of CIP and SIP steps, the project lead time for implementation of single-use production plants is reduced by at least eight months compared to stainless-steel reactors. Single-use systems can also achieve significant reductions in labor costs and enable faster batch-turnaround and product changeover. For instance, if a facility using stainless steel reactors produces 15 monoclonal antibody (Mab) batches per year, the shorter turn-around time for single-use bioreactors could allow production of about 19 batches per year, which in turn increases the productivity of a single-use facility and lowers its overall operating costs per batch. 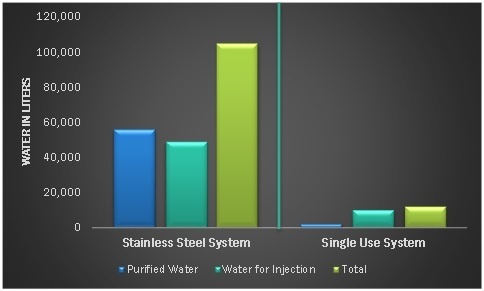 Studies show that costs related to testing, validation, and implementation are much higher for traditional stainless steel systems compared to single-use systems. Product cross-contamination is a major problem in the healthcare industry. The potential for cross-contamination occurs when the same process equipment is used to produce several monoclonal antibodies or proteins. Unwanted protein contamination may reduce production yields by requiring additional purification steps, or in the worst possible case, proteins that co-purify may result in potentially fatal treatments. Since the product flow path is discarded and replaced after each batch, the risk of product cross-contamination between batches is virtually eliminated when using single-use systems. In November 2014, Amgen (Singapore) announced an investment of USD 200 million to set up a biomanufacturing facility, which uses single-use systems in 90% of the plant’s operations. The key industry participants are aggressively following the strategies of mergers and acquisitions in order to strengthen their position in the market. In recent years, the market has witnessed the acquisition of a number of small and medium-sized companies by players focusing on strengthening their market presence or entering into the single-use bioprocessing business. For instance, in August 2015, Danaher Corporation entered into the single-use bioprocessing business by acquiring Pall Corporation (US). Similarly, in February 2015, Thermo Fisher Scientific strengthened its product portfolio of bioprocessing systems by acquiring Advanced Scientifics (US). In April 2014, Sartorius acquired the majority stake in the US-based startup, AllPure Technologies (US). Such strategic initiatives allow organizations to easily access untapped markets, which in turn is expected to boost the global single-use bioprocessing systems market in the coming years. For more in-depth industry analysis, see the 149-page report by MarketsandMarkets on the single-use bioprocessing market. Click the button below to view the report page on MarketResearch.com. About the Author: Prachi Saxena is a Research Manager at MarketsandMarkets, a global market research firm.